Tremont Pointe in Cleveland. Photo by McCormack Baron Salazar. Information on income and tenure can help us begin answering this question by providing insight into the nature of mixed-income developments and the impact they have on residents and communities. In the first comprehensive descriptive data analysis of the overall production of HOPE VI units, the HOPE VI Data Compilation and Analysis provides a descriptive analysis of the HOPE VI grantees’ quarterly report data from 1993 through 2014. In order to better understand the results of the largest federal mixed-income housing policy, our research team at the National Initiative on Mixed-Income Communities asked: What is the income and tenure mix of housing units that have been produced through the HOPE VI program? Ultimately we found that across HOPE VI developments, the income/tenure mix is quite different: there are many different types of mixed-income developments, and in the case of some HOPE VI sites, there’s no mix at all. We asked a straightforward research question and came up with a seemingly straightforward answer, but found that there are much deeper policy and research implications embedded within the findings of our descriptive analysis. Here, we focus on four key findings and subsequent calls for action. For more details, please refer to our report here. FINDING 1: Public-private funding made HOPE VI happen. We found that most budgeted funding was expended and that funding declined over time. Funding for the HOPE VI program dramatically decreased after the 2003 award year due to the Bush administration’s efforts to eliminate the program. For every $1 of HOPE VI funds, about $1.30 was leveraged by private sector funding, which is emblematic of the public-private partnerships integral to the development of mixed-income communities. Manage the market risks of privatization. The mixed-finance approach to HOPE VI (including market-rate rental and homeownership) made the redevelopment efforts extremely vulnerable to delays in construction timelines or shortfalls in the construction of market-rate units. Policymakers should consider ways to offset the market risk, perhaps by considering whether there might be a benefit to smaller redevelopment phases. Some housing authorities are also exploring a new method of purchasing existing market-rate developments and inserting affordable units into the buildings to create mixed-income housing. FINDING 2: There was a decrease in the overall number of public housing units, and most of the units that replaced those lost public housing units were built for low- to moderate-income residents. Balance dual priorities: end segregation and concentrated poverty and increase affordable housing for low-income residents. It’s ideal to be able to produce more high-quality public housing and facilitate access to more vibrant, socioeconomically diverse neighborhoods. Policymakers must continue to be as intentional and comprehensive as possible in their efforts to use existing public resources to maximize the provision of low-income housing while leveraging private sector resources to generate investments in those developments and their surrounding neighborhoods. Clarity about the intended balance of these conflicting goals and vigilant accountability will be key. FINDING 3: Return rates were low, reinforcing a trend. Relocation and return processes continue to be a main challenge for public housing transformation. Increase the rate of return for original public housing residents. 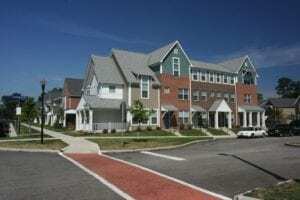 A major program shortcoming was the limited proportion (27.5 percent) of original residents who benefited from the new, higher-quality housing and living environments. While some non-returners possibly used the relocation opportunity for upward mobility to a low-poverty neighborhood, the literature suggests mixed results for those who did not return and for voucher holders in general. The policy implications include increased resources and attention to the relocation support process and strategies to make return easier, such as smaller redevelopment phases and phased relocation onsite, or in close proximity so fewer residents are disrupted. FINDING 4: Community and Supportive Services were provided to residents, but not all goals were met. Supportive services include employment programs, job skills training, high school or equivalency training, ESL education, counseling, childcare, transportation assistance, substance abuse programs, entrepreneurship training and homeownership counseling. However, goals for the number of participants completing programs in the areas of employment, entrepreneurship training, and homeownership were not met. In some cases, HOPE VI grantees were able to exceed their enrollment goals, indicating that they succeeded in linking with local partners and programs that were offering the forms of support needed, but it is unclear if enrollments turned into sustained engagement or meaningful outcomes for participants. Provide the requisite support services for positive outcomes and capture the outcomes more effectively. Stronger performance measurement and reporting of resident outcomes would provide a critical knowledge base on the upward mobility outcomes of residents in diverse mixed-income contexts as well as those who did not return. The results of various levels and combinations of supportive services would also shed light on these outcomes. How do outcomes compare among: original residents who return, newcomers to the public housing replacement units, residents of the affordable units, and residents of the market-rate units? The characteristics, outcomes, and impact of public housing homeownership programs is an under-examined area, including which residents qualified and participated, and their outcomes. The focus in the report, given the data available, was on the developments and not the broader neighborhood context. However, the surrounding neighborhoods are an important dimension to be included in future research, both as a context that shapes the strategies and outcomes in particular developments as well as a unit of change impacted by the redevelopment. We face a rapidly diversifying, polarized America that is actively experiencing budget cuts to our already-meager social supports and barely existing safety net. It is the responsibility of policymakers and practitioners to ensure that housing policies serve as platforms for individual social and economic mobility and opportunities for equity and inclusion. We must continue to lift up the successes of past programs to build on lessons learned, especially in the midst of a challenging political landscape. Now that this comprehensive HOPE VI dataset has been extracted and compiled, it should serve as a resource to others looking to investigate unit production and other dimensions of the HOPE VI program. We have made it available for further analysis as part of the online Mixed-Income Development Database (neocando.case.edu/nimc/) hosted by the National Initiative on Mixed-Income Communities at nimc.case.edu. More findings of our research can be found in the report here and here. Taryn Gress, M.S.S.A, is the program manager of the National Initiative on Mixed-Income Communities. She holds a master’s degree in social administration from the Mandel School of Applied Social Sciences at Case Western Reserve University. Emily Miller, M.S.S.A. is a project coordinator and research assistant at the National Initiative on Mixed-Income Communities. She holds a master’s degree in social administration from the Mandel School of Applied Social Sciences at Case Western Reserve University.